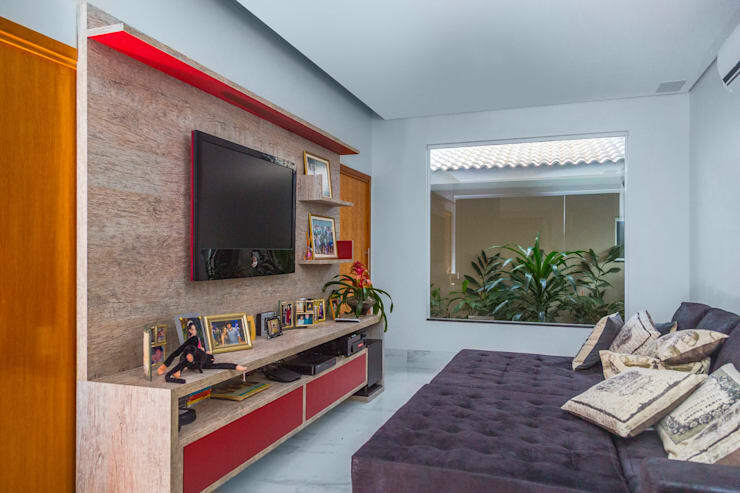 Rendered by the architects at Daniele Galante Arquitetura in the Brazilian city of Presidente Prudente, this lavish villa comes with an elegant facade and a stunning backyard. Folding glass doors wrap the house on most sides, giving the building a very fashionable look and ensuring stunning views of the garden and pool. The rooms inside are separated with glass doors as well, so that the interior seems open, expansive and airy. 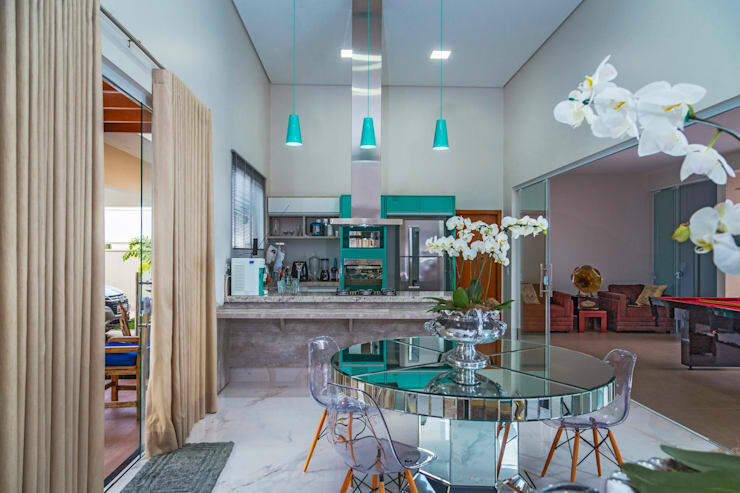 Ultramodern furnishing, beautiful lights, sudden pops of vibrant hues, and wooden elements add smartness and warmth to Residencia E & A. Read on to see more! Interesting lines and angles, conventional shingled roofs, and wooden and stone elements make the facade interesting as well as inviting. 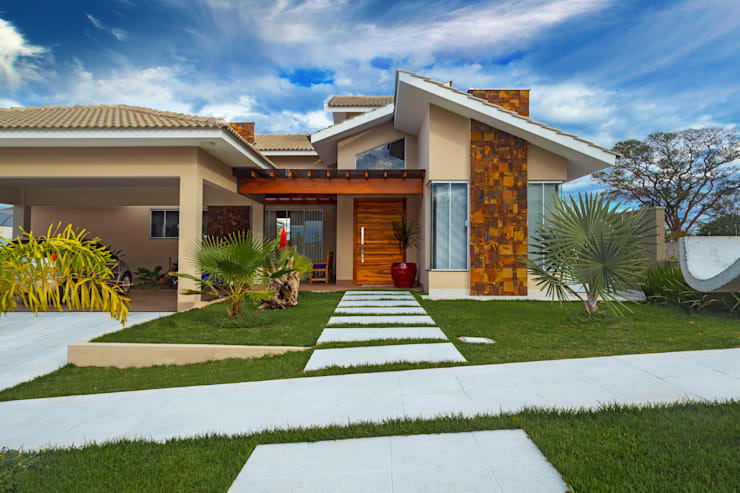 Neatly manicured lawns and trendy walkways add pizzazz to the villa’s setting. 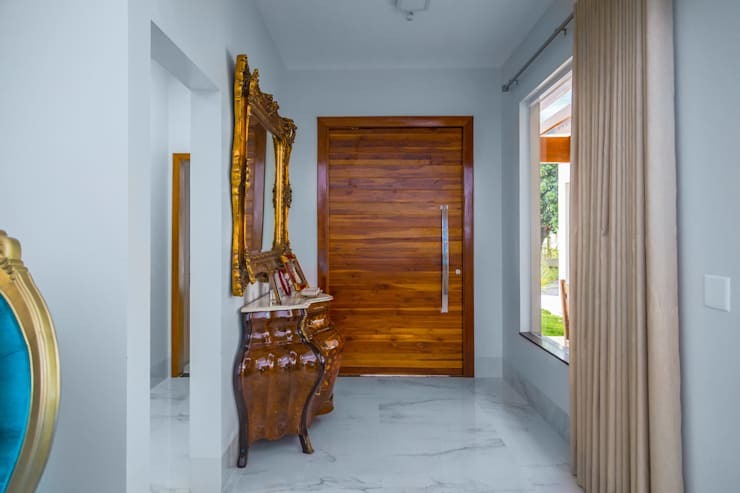 The rich wooden entrance door with its slim steel handle brings you to the white and bright entryway. An ornately carved mirror and a vintage-style bureau add loads of charm here, while a large window keeps the space sunny. A small open kitchen is separated from the other parts of the house with stylish glass doors, and is a very practical and smart space. 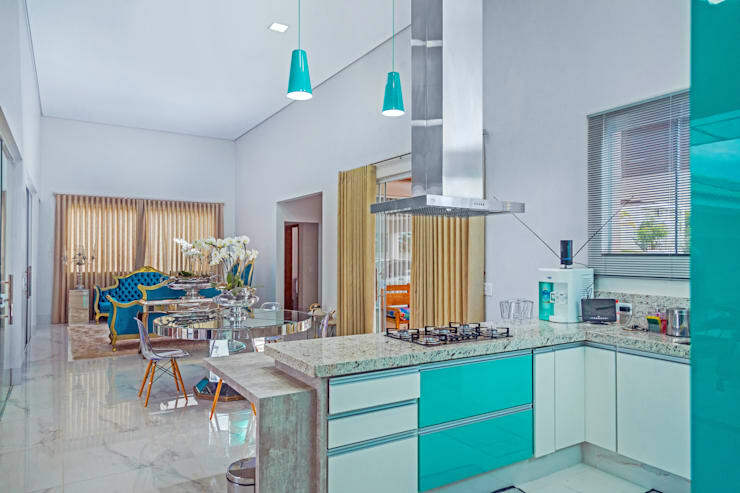 Splashes of turquoise on the cabinets and lamps add fun to the kitchen, while the casual dining arrangement looks unique. The mirrored round table is a glamorous addition, while the transparent acrylic chairs with wooden legs are ultramodern. 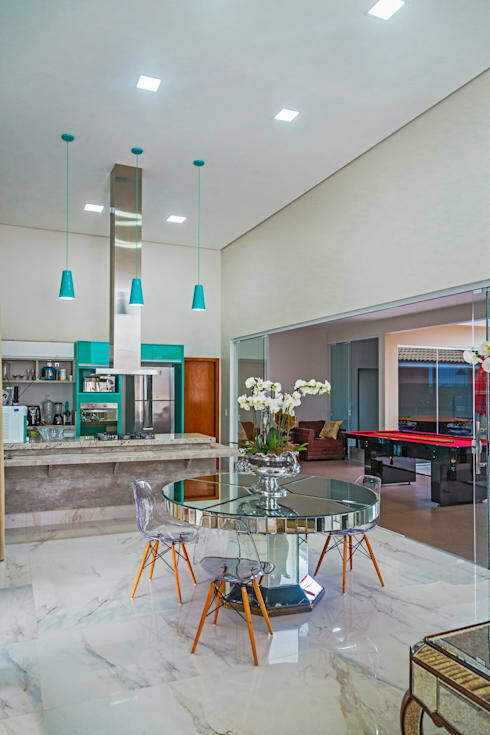 Sliding glass doors take you from this informal kitchen and dining area to the pool table. Play here with friends or relax in one of the armchairs with a book. Your pick! The playful kitchen and glamorous dining arrangement has been beautifully merged with the living area of the house. Regal blue sofas offer stylish seating in the living space, and the lack of interior walls make the home look open and breathable. 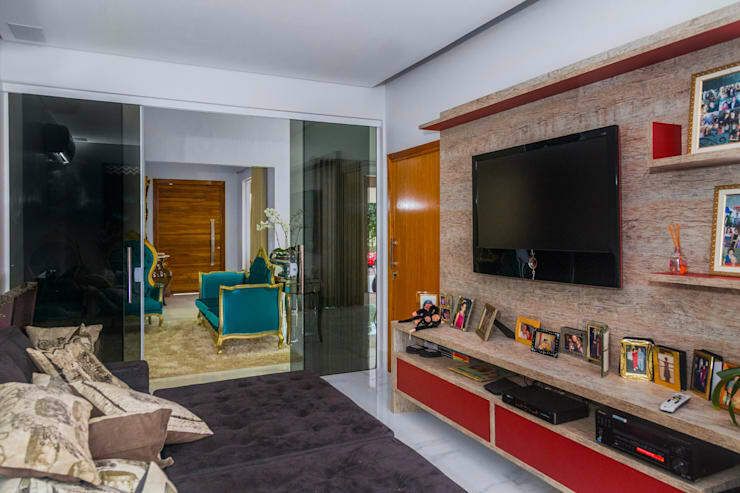 Tinted and sliding glass doors stylishly separate the living space from the media room. Now the family members can watch TV in peace even when someone is receiving guests outside. The sleek wooden unit holding the TV comes with useful shelves and drawers, and adds a warm feel to the media room. A touch of bright red livens up the atmosphere, while a large window brings in natural freshness. The seating is trendy and immensely comfortable. 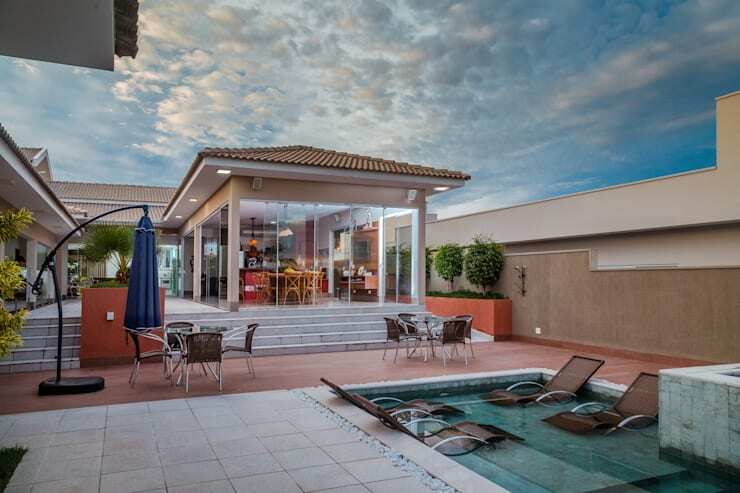 The games area helps the interiors to connect with the expansive and airy backyard brilliantly. 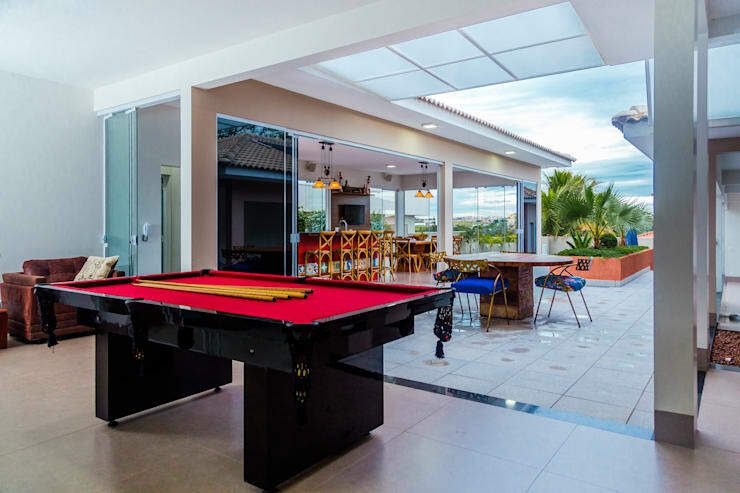 A stylish table surrounded by chairs with bright blue seats offer seating for those who want to enjoy fresh air and yet want to watch a game of pool. From the open backyard, we get to admire another kitchen in this villa. 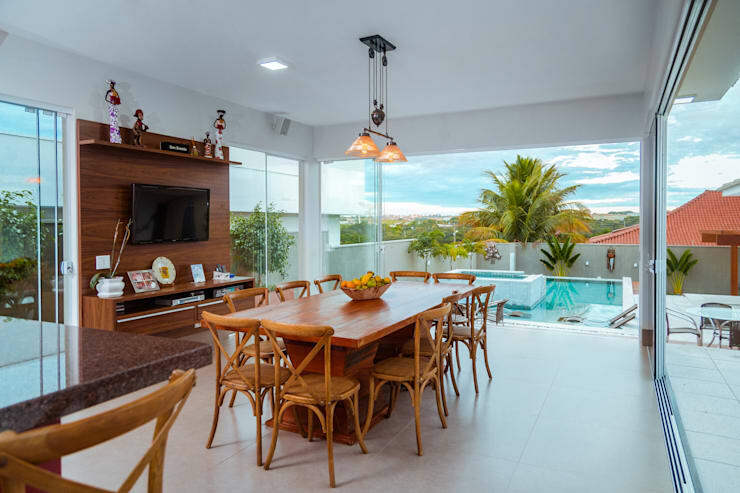 Separated from the outdoors with folding glass doors, this open kitchen is a bold red affair with elegant bar chairs, pretty lamps and tasteful appliances. The dining area adjoining the red kitchen is very warm and sophisticated, thanks to the beautiful wooden furniture. A sleek panel with shelves holds the TV, while chic lights add a hint of cosiness. 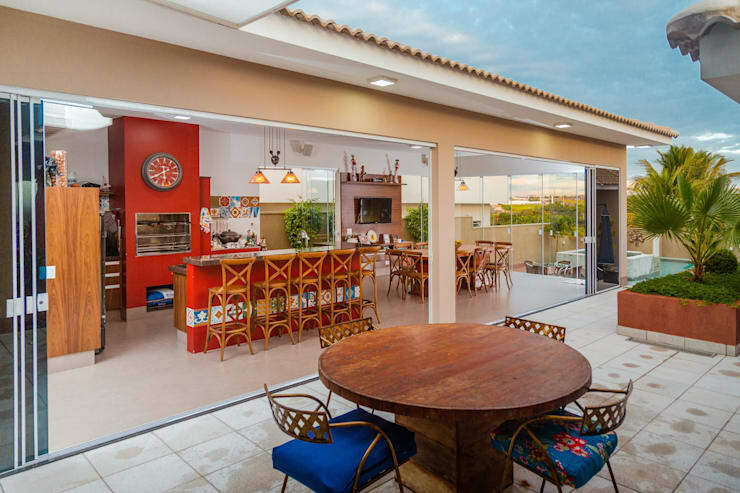 Glass doors on all sides ensure that the diners get to admire the pool and the surroundings with ease. 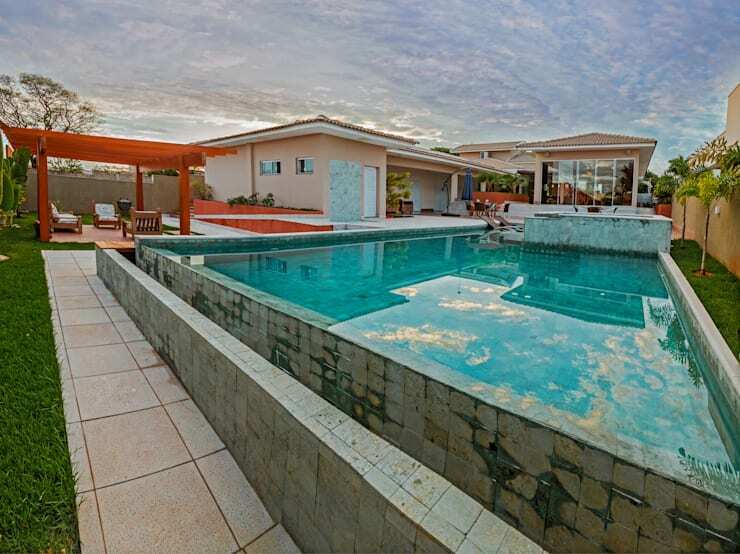 The pool and its surrounding deck are at a lower level than the villa, and promise tons of outdoor fun on weekends or in the evenings. Casual and stylish seating arrangements have been made here, while large planters add charm to the space. This side of the pool features submerged recliners which invite you to unwind elegantly in the cool waters. The rest of the pool with its crystal clear turquoise waters is perfect for taking a refreshing dip. Surrounded by neat walkways and green strips, the setting looks stunning. A wooden gazebo in the distance offers a cosy spot for chatting as well. For more ideas, take another delightful home tour: A marvellous house for families with children.